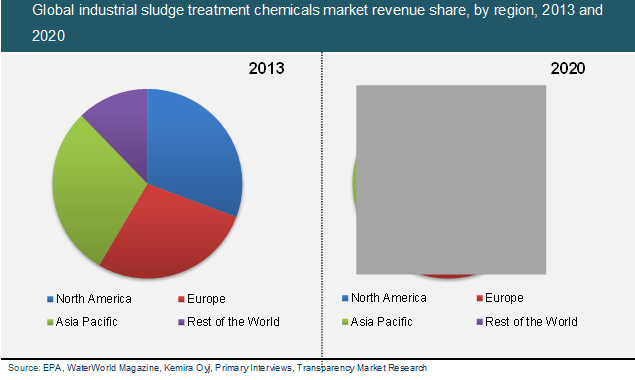 The global industrial sludge treatment chemicals market depicts the presence of a highly consolidated vendor landscape, in terms of market shares owned by individual companies, says Transparency Market Research on the basis of a newly published report. However, with new players entering the market on a regular basis, the vendor landscape is expected to experience an invigorated competition during the next few years. Most companies focus on providing integrated industrial sludge treatment solutions as a key strategy to generate revenue. In this way, the growth of such businesses gets boosted, along with client retention by providing quality treatment chemical compounds. Developing cost-effective and innovative products too has been a critical scheme implemented by businesses present in the global industrial sludge treatment chemicals market. Owing to innovative production methods introduced, several players are aiming towards increasing product yield and production capacity, as well as regulating product costs. Ashland, Inc., The Dow Chemical Company, Kemira Oyj, Nalco Holding Co., Kurita Water Industries Ltd., GE Water & Process Technologies, BASF SE, Accepta, Ovivo Water Ltd., and Solvay S.A., are key players operating in the global industrial sludge treatment chemicals market. According to experts from Transparency Market Research, this market is expected to fetch revenue worth US$6.07 bn by the end of 2020, which is a decent increase in its earlier revenue of US$4.09 bn registered in 2013. This growth is projected to occur at an impressive CAGR of 5.8% measured during the forecast period from 2014 to 2020. Rising industrialization has led to the formation of increased quantities of industrial sludge, thus spiking the need for its treatment, consequently bolstering growth in the global industrial sludge treatment chemicals market. Such industrialization is mainly occurring in developed countries located in regions like North America, Europe, and parts of Latin America. With the introduction of innovative and cost-effective industrial sludge treatment chemicals, the market’s growth is expected to receive a powerful impetus during the upcoming years. Promising growth opportunities lie ahead for most companies present in this sector. Moreover, favorable treatment-based governmental regulations regarding following strict norms that deal with causing least harm to the environment too is expected to drive the global industrial sludge treatment chemicals market. However, high costs of producing the treatment chemical compounds owing to expensive raw materials and equipment is notably hamper the market. This is mainly due to the inability of small-scale businesses to bear such high costs, thus making them look towards alternatives when it comes to industrial sludge treatment. Moreover, such chemicals are not easily available all over the globe, thus restricting the global industrial sludge treatment chemicals market’s growth from a regional perspective. However, several players are involved in development of cost-effective and innovative industrial sludge treatment chemicals. This is anticipated to create immense growth opportunities for players present in the market, thus offsetting most restraints. Additionally, recycling of treated industrial sludge holds immense potential in the industrial sludge treatment chemicals market too. Rising industrialization has led to the formation of increased quantities of industrial sludge, thus spiking the need for its treatment, consequently bolstering growth in the global industrial sludge treatment chemicals market. Most companies focus on providing integrated industrial sludge treatment solutions as a key strategy to generate revenue.